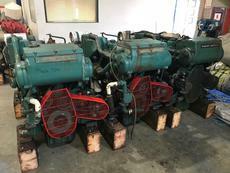 Volvo Penta TAMD122D 480hp @ 2050RPM. Six Cylinder Turbo Intercooled with Heat Exchanger Cooling. 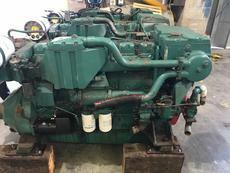 We have a number of these engines available with remarkably low running hours (sub 3000 from new). Removed from training vessels as part of a planned upgrade. Engines were sea trialled prior to removal and performed without fault in heavy weather. The rear of the engines are fitted with PTO flanges which then drove into V drive Twin Disc gearboxes (also available). PTO Flanges can easily be removed to allow fitment of a suitable conventional gearbox. We have four of these units in total and will consider selling single units. 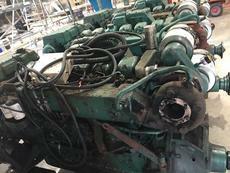 They can be supplied in "as removed" condition or fully serviced and repainted dependant on buyers requirements. Instrumentation, extension looms, V drive Twin Disc gearboxes, 4 blade propellers and 4.5m long propeller shafts and couplings also available by separate negotiation. Shipping can be arranged anywhere in the UK or Worldwide at buyers cost. Export enquiries very welcome.